Our project group has not officially met yet. Hence, I proceeded to do some research of my own and found a company Color Change Corporation ( www.colorchange.com ). This company specializes in materials and products that change color, especially thermochromics (what was used in the previous part of this project, inks which changes colour with temperature) and photochromics (inks which changes colour with light). 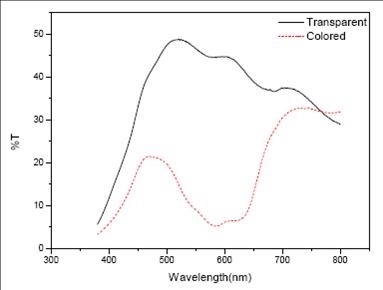 Photochromic ink seems to be a feasible solution for our project, therefore I proceeded to read on more. Photochromics Inks are either reversible or irreversible. Of course, we are interested in the reversible ones for obvious reasons. Reversible PC's change color in the presence of UV light but return to their original state when the UV source is removed. Some examples of reversible photochromic applications are Transitions® lenses, screen printing inks, sunglasses, nail polish, and novelty items. I met up with Roshan this week. He is a research engineer at the Mixed Reality Lab and my supervisor for this project. - aim of the project is to create a material which can change colour. A properly stabilized photochromic ink will last for years on the shelf, but even the best of them will withstand only a few months of outdoor exposure after printing. The best photochromic textile inks will withstand about 20 washings after printing and are even more susceptible to the negative effects of chlorine bleach than their :thermochromic counterparts. Interactive media is the keypoint. Professor Cheok strongly highlighted how interactive wearble media could play a part in our lives in the future. Not to mention fashion which it would manifest its usefulness to the greatest, there are many uses. For eg. health indicators, warning systems, emotion indicators etc. 2) To come out with prototypes for testing. Just found an article which seems to answer to all our problems!!!!!!!!!!!!!!!!!!!!!!!!!!!!!!!!!!!!!!!!!!!!! lens is 45% on transparent state, and 5% on colored state. and then an opposite 0.2~1.4V DC was applied for 1s to color the lens. raise the applied voltage, but the change became smaller gradually. 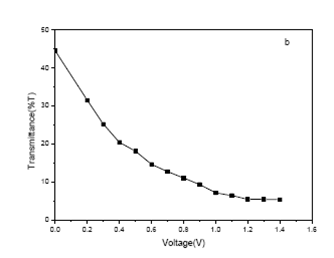 After 1.2V DC, the spectrum curves almost overlay with each other. materials, and is quite enough for hiking, skiing or motorcycling. This article gave a very in depth how to use electrochromic layers especially in glasses and I believe we can incorporate thes properties into fabric after reading it. Dr Greg Sotzing of University of Connecticut. He invented threads made of electrochromic polymers which can be used with metal wires to be woven into fabric and shirts. At the moment the fibres change from orange to blue and from red to blue, but Sotzing also hopes to create threads that change from red, blue and green to white. this is his website. They are a material science lab which specializes in polymers and electrochromic properties. 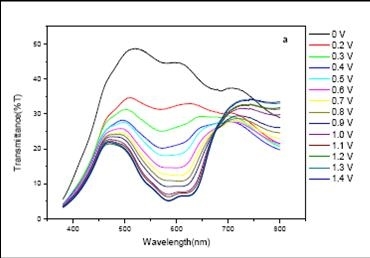 """Electrochromic polymers are coloured because the electrons in their chemical bonds can absorb light across a range of visible wavelengths. When a voltage is applied it changes the energy levels of these electrons, causing them to absorb light of a different wavelength, and changing the material's colour. When the voltage is reversed, the electrons return to their usual energies and the original colour returns. Previously researchers have used dissolvable moulds to shape electrochromic polymers into thin cylinders. However, this only allowed them to create "fibres" a tenth of a millimetre long, far too short to be woven or knitted into a fabric. Sotzing's secret is to spin the polymer, allowing him to make continuous threads up to 1 kilometre long. He and his colleagues used a process called electrospinning, in which a solution of a polymer is squirted out of a nozzle and drawn out into a thread by its electrostatic attraction to a nearby charged target. While in solution at high pressure each polymer molecule remains separate from the others, but as the solution leaves the nozzle, the pressure drops and the solvent evaporates. This causes the polymer chains to tangle together into a single slender thread, just like a rope made of intertwined fibres. """ Was also researching on conductive yarns and found a company called novonic. They are a company based in Germany, offers conductive yearns that can be used for data transfer, power transfer as well as for textile based heating elements. The flexible core ensures sufficient mechanical stability combined with high flexibility. The spiral-shaped twist of the wire ensures the stretch resitance of the electrical conductor. The outer textile twist protects the yarn against overstretching and abrasion. These conductive yarns can be further processed with the usual textile-technical methods. Implementation of the communication between PIC and the computer was a major problem. Had not touch C programming for ages and had to read through so much basic stuff. TX and RX worked separately on its own, combining them was an issue. Integrating TX tog with RX seemed to be a problem. Printf and other printing functions proved to be a problem too. Emissive displays are definitely far superior in terms of display quality. With LEDs mainly as the medium of display, it can encompass infinite display contents just like a television screen or computer screen. All that is required is information fed into the system and an entire spectrum of colours can be displayed. However, comfort is very often compromised due to the bulky electronics embedded within the fabric. Also, emissive displays tend to be slightly “loud” for people to wear. It may be good for promotional and campaign activities but most people would prefer to wear something more passive. Also, due to the electronics within the fabric, these fabrics cannot be wet washed henceforth are not very appealing or suitable for the mass or as a common day to day product. Non emissive fabric display provides a revolutionary breakthrough in the fashion industry. With comfort not compromised, users are still able to express their emotions, to communicate and to personalize. With the main display system as chemicals within the fabric, it exists as a product more feasible to serve as clothes the masses can wear everyday since it would be washable. It is easier for mass production as well and therefore would not be as costly as emissive fabric display. Its non emissive properties also means that the users will be wearing something subtle yet expressive. Thermochromic is currently the most commonplace technology used in non emissive fabric display to show colour change. Firstly thermochromic inks are readily available in the market, therefore, this makes it more commercially available and cheaper as compared to the others. Its technologies are very advanced compared to other inks allowing it to portray a wide spectrum of colour with delicate temperature sensitivity. The current techologies therefore offers a wide range of choice uses for it and the use of thermochromic can be said to have reached a stable stage. Electrochromic is still a very foreign introduction to fabrics with today’s technologies. However, many researchers like Dr Greg Sotzing are working on electrochromic technologies due to its great potential especially as a form of fabric display. Firstly, electrochromic materials are cheap. Next, only a little energy is needed to stimulate a change in colour and no energy is needed to upkeep it. Dr Greg Sotzing has invented electrochromic fibers which reacts to electricity to trigger a colour change. However, the technologies and products related are still very limited; it is pretty much still in its infant stage and have not attained stability as compare to thermochromic inks. Finally! The inks arrived. Without wasting time, me and Andrea proceeded to test the inks. We had ordered 3 colours. Red – Activation temp was at 15dc. Green - Activation temp was at 35dc. Blue – Activation temp was at 47dc. Applying the inks in layers did not work. ie to say screening one layer followed by another layer after drying the previous. Therefore, we proceeded to mixing the inks together first together with the ink binder. A good balance of ink and binder was also needed to be achieved in order for the thermochromic properties to be optimum.